#6 train to 33rd – Bring I.D. 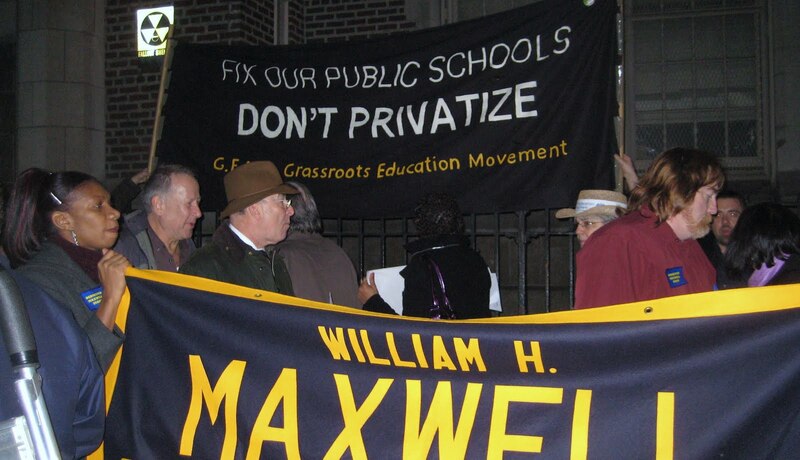 In 2008, after a militant 10 day strike, the FMPR stopped the charter school privatization threat on the island-nation. 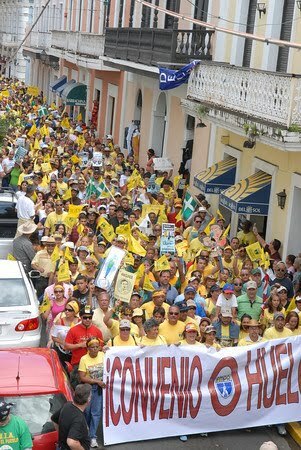 Despite the Puerto Rico laws against public worker strikes, the FMPR (80% women) continues to represent and fight back as a democratic bottom-up rank and file union. Today the FMPR again resists privatization, charters invasions, violations of teacher & public worker rights, cutbacks and massive layoffs. As more draconian cutbacks loom, the FMPR leads protests along with debates on how to successfully build a united struggle nationwide. In NYC, GEM has campaigned against the very same destructive federal government “No Child L eft Behind/Race to the Top” policies that Puerto Rico also faces, despite different conditions. GEM addresses issues such as test-driven curricula, the displacement of seasoned veteran teachers (ATRs), school closing, private charters, dictatorial mayoral control, privatization and union-busting. Over decades, the FMPR has worked to empower their members and school communities. The FMPR supports school teacher-parent-student committees with significant input. FMPR union chapters have autonomy and are supported when militant job actions are necessary. The FMPR consistently seeks to educate and organize through general meetings, educationals, media campaigns, litigation, legislative initiatives, guerrilla theater, militant job actions and more. The FMPR model of social justice unionism provides many lessons for us here. We too have much to share. Join us in this important dialogue. groups and movements worldwide are struggling against the increasing marketization and privatization of public education and for free and emancipatory education. Personally I believe we can only be successful, if we unite on an international and global level in the long run. Therefore consider to make use of the independent platform called “International Student Movement” to exchange information, network and co-ordinate protests on an international level. The platform is being used by groups and activists struggling for free education worldwide. Get involved – Get organized! Feel free to get in touch with me [united.for.education@gmail.com] for questions and suggestions. Can you forward this message/help spread the word? The following is a link to to an online open letter that will be delivered with signatures and comments to the Committee on Education and Labor on March 26, 2010 as part of the public comment record on the reauthorization of Elementary and Secondary Education Act (formerly No Child Left Behind). The letter asks the Committee to consider 1) testimony and research that points to the likely negative consequences of the policies being considered for the reauthorization and 2) testimony and research that highlights the democratic and progressive educational traditions as an alternative approach. Please consider signing the letter. Please forward the letter to individuals and organizations that may sign the letter and spread the word further. Following, consider the shade and structure of the meat. A wonderful steak should certainly be company towards the touch, moist, and vivid in shade. It have to be well marbled with skinny streaks of white body fat all through plus a skinny crust of meat around the exterior. In our additional fat informed culture, we are most likely to show up for lean cuts of meat, however the skinny streaks of white excess fat marbled throughout the meat christian louboutin shoes will certainly be the vital in to a tender juicy meat.